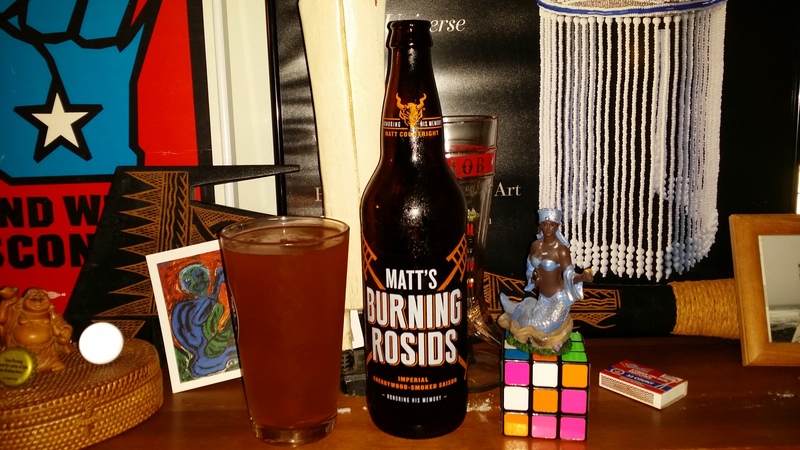 Stone Brewing’s Matt’s Burning Rosids, an imperial cherrywood smoked saison. Looks like a cloudy wheat beer with a little red hue. Tastes like a complex saison with a hint of spice on the back of the throat. This beer was made in remembrance of Matt, and it sounds like he was a pretty good guy. 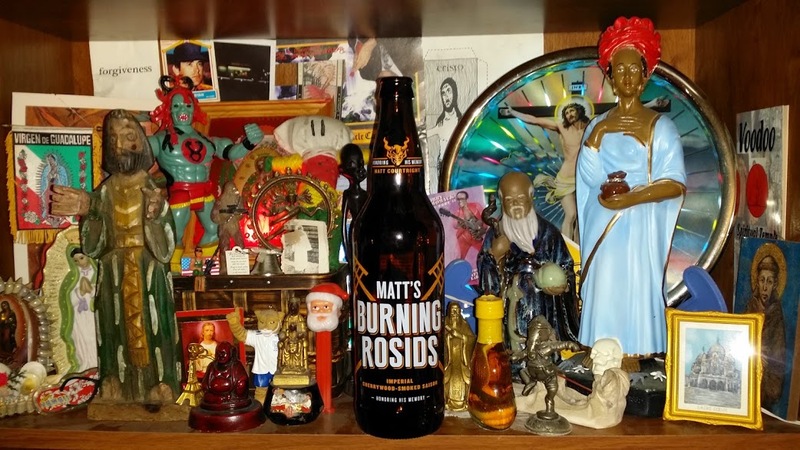 Brewer’s Description Rather than regarding Burning Rosids as a somber memento, please think of it as a celebration of Matt, just as we do. When you drink this very special beer, please join us in raising your glass, both in Matt’s memory and in tribute to everything he so passionately stood for: caring for others, passion and skill for his art, and laughter… lots of laughter. Among the long list of things he held dear were GoDesignInc.org, a charity committed to fulfilling the architectural needs of developing communities around the world; and TKF, a nonprofit working to stop youth violence by educating, mentoring and making positive impacts on high-risk communities. We are proudly contributing funds earned through the sale of this beer to these worthy organizations in Matt’s honor. Enjoy, and please remember that life and those we hold dear are precious gifts to be cherished every day. Consider sharing this beer, conversation on life’s passions and, again, lots of laughter, with good friends as we remember ours. This entry was posted in Beer, Educate, Enlighten, rauchbier, Smokebeer and tagged 3 - 4, boozy, California, cherry wood, imperial, saison, Stone. Bookmark the permalink.